This devotional and encouraging book presents Luther and his ideas through the eyes of various members of a family that knew him. From Fritz, a monk who travelled to Rome with him, and Else, who struggled with not being religious enough because she was not a nun, to Eva, a nun who rejoiced to share Luther’s ideas with the other sisters including a certain Catherine von Bora, the characters in this story all have their fundamental ideas about God and life challenged by Luther’s teachings. Parents, grandparents, younger siblings, and others all respond in their own ways, and this gives a multifaceted approach to Luther that I have never encountered before. Even though this book was first published in 1862, the characters’ struggles make it exceedingly relevant to our age. Many devout Christians of today think that they are not ‘good Christians’ because they are not devoted enough to God. They devalue the work God has given them in this world and wish to creep away from the everyday world into the cloister of ‘ministry’. * Many fundamentally misunderstand who God is because they do not read the Bible. Many are kept away from the Bible by the foolish ideas of others, society, or the media, or are kept from seeing its truth by refusing to learn from those who came before and struggled with the same issues. * And often we 21st century Christians mistranslate the gospel into social actions that it does not support, twisting the command to love into an economic or political platform. It was the same during Luther’s time, as this book clearly points out. This all may sound dry and dull, but the characters are endearing and the plot beguiling. Although this is not a thriller by any means, it is an excellent story in its own way. I loved the characters, felt completely at home in the book, and found it a source of real joy, for it is filled with truth and comfort. And this is its comfort: Luther by Those Who Knew Him shows the transforming power of the Bible. It shows the tremendous love and kindness of God who sent Jesus to give us his righteousness, because our own righteousness is completely inadequate. It also shows the incredible value of the faith by which we are saved. And, throughout the book, the glory is given to God, not to Luther. You may recognize the Five Solas of the Reformation here; although they were formulated after Luther, they are the basis of his thought and of this book. Luther by Those Who Knew Him is neither an ordinary biography nor an ordinary novel, although it has elements of both. Nor is it a volume of theology. Perhaps it is most accurate to describe it as a devotional in story form based on Luther’s writings and life. Even so, it deals with politics, everyday life, revolution, and even romance in a way that draws the reader into all strata of 16th century German life. It is among my favorite books on Luther and I think it would benefit anyone who knows the basics of his life and ideas (e.g. from Simonetta Carr’s Martin Luther, the great 1953 movie, Martin Luther, or Robinson’s Luther The Leader, which I have read to my children several times). This book is not available on Amazon and you will need to go directly to the publisher’s website to order it; it is near the bottom of this page. *See Nancy Pearcey’s Total Truth for a discussion of aspects of these ideas. 2017 is the 500th anniversary of Luther’s Ninety-Five Theses, so a plethora of books is being published about him;I am blessed to be able to review several of them. This is probably the most devotional of the many Luther books I’ve read in my life. 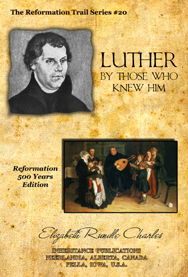 Disclosure: I received a copy of Luther by Those Who Knew Him as well as Martin Luther: The Man and His Work from Inheritance Publications and have chosen to review this one. Posted in: 52 Books in 52 Weeks, Reviews, Reviews: Fiction, Reviews: Nonfiction, Reviews: Reformed.